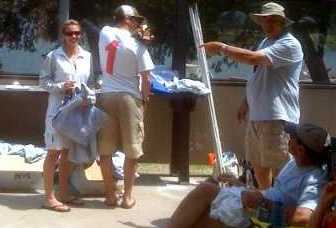 Chris Nesbitt and Danielle Berge won the Lido 14 division at the Lake Piru Regatta. Chris is a member of Balboa Yacht Club and Lido 14 Fleet 1. The following report is from Danielle. Aside from some recent Wednesday night club races, this was her first regatta. 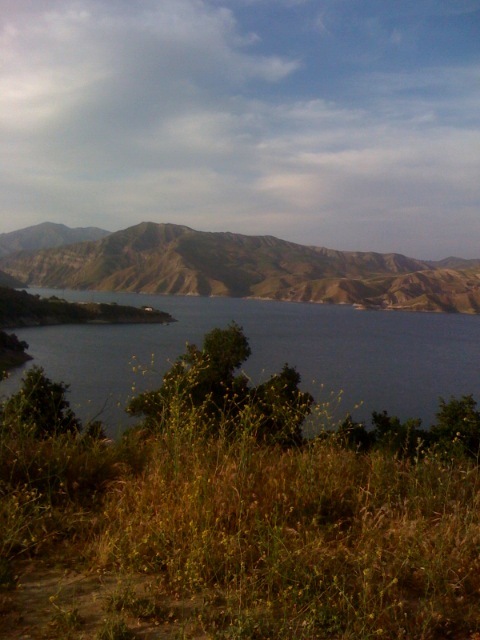 On May 3rd and 4th the San Fernando Valley Yacht Club hosted their Lake Piru Regatta, just outside of Los Angeles. As we approached the venue, the view from the car window promised a weekend with plenty of wind and beautiful blue water. The event got underway just before noon on Saturday. The shore filled up with enthusiastic spectators wearing Mardi Gras beads and flaunting goofy hats. As soon as we put the boat in the water we realized that the view from the road had been very misleading. A majority of the lake was covered in a film of burnt debris, which jammed our centerboard, and logs floated just below the surface of the water waiting to sink your boat just as the iceberg did to the Titanic. The wind proved to be a challenge for everyone as it was inconsistent and unpredictable. One team was caught unprepared as the wind shifted and capsized their boat approximately 30 feet from the finish and in plain view of the race committee and spectators. The crew stood on top of the boat holding up the board as the skipper treaded in the water working to overturn the vessel. This happening merited its own special trophy, a rubber fish. The SFVYC knew exactly what everyone needed after a full day of sun and fickle winds…Margaritas, of course! They hosted an extremely festive potluck with a “Margarita Engineer” who made a variety of tasty concoctions. Once again, there was an array of goofy hats, including sombreros, and oversized necklaces. They boasted a fire second to none, in terms of heat, which was made of charcoal briquettes. On the walk back to our campsite we got to enjoy a variety mix of music, ranging from Queen to gangster rap, that other campers were blaring . We got to enjoy the music mix well into the wee hours of the morning. This particular campsite crammed people in as if they were sardines. Peace and quite was never achieved. Sunday gave everyone a chance to get in two more races before the awards ceremony. There was much more wind and the races went fast. Boats were pulled out of the water and broken down quickly and all crews headed up to the snack bar to await the closing of the weekend. The ceremonies were marked by beer, humor, SFVYC tee shirts, trophies and a ton of pictures. It was a fun ending to the weekend.